My Star Alliance status distorts the on boarding process compared to a regular economy passenger. So to does travelling with my family. The status gets me premium check-in, lounge and premium boarding. In other words a great experience. The family gets me annoyed kids and a slower than usual progress. In other words a Simpsons like you asked for it you get it experience. On both sides of the draw belt it looks like a typical boarding process. The Air NZ lounge in Sydney is the second best in Sydney (behind the killer QF first class lounge). The Queenstown lounge is too small and was full when we went to use it but that can be somewhat expected. Big negative is that no one at check in told us we had to go to a separate window to pay the NZD25 departure tax. Would have thought this should be in the standard script for check-in. This is the unfortunately redundant part of the review (with the Skycouch coming - full story on new Skycouch here). That all said, the current product is as good as any economy class seat I have flown. Pitch and width are fine. The tray table can be dropped in a half or full mode, which is great for making exits when there are drinks of the table. The remote control is in the back of the seat in front eliminating any accidental bumps, fast forwards or language changes that come from having it in the arm rest instead. Farewell well constructed Air NZ economy seat – we hardly knew thee. I like the NZ culture – Australia with even more of a smirk and one step even more relaxed. Like a cross between the Australian and Scottish cultures except a little more understandable. 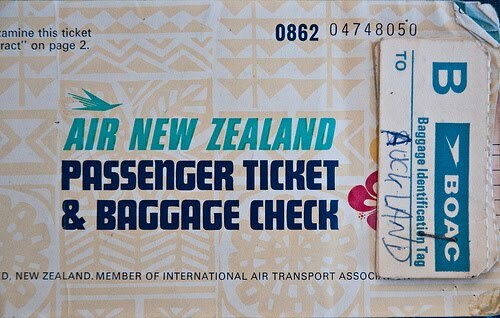 The Air NZ service is similarly fine for economy class. There are two tests for economy class services. Can you find the staff when you need them (do they respond to the bell) and Do they look for you every now and then to give random acts of service. 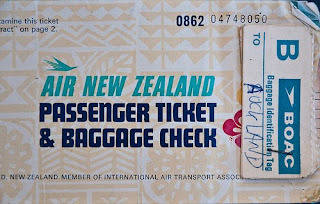 Air NZ pass in both fronts. For a sub-three hour international flight in economy, the food was much better than expected. A warm and flaky meat, cheese and mushroom pie was enjoyable though the side serve of potato salad was neither enjoyable nor really a salad. More like chalk with pesto rather than a food product. Drinks were the usual with a twist – the twist being New Zealand wines. As a side note – we should all add Otago Pinot Noir to the Marlborough Sav blancs on the list of Southern Hemisphere viniculture treasures. Kids loved the increase which in stark contrast to the usual air served ice cream was not rock hard or milk shake wet – rather it was just right. Great system. 26 films from 1950-2010. Mixture of classics, art and blockbusters. Street Car Named Desire to Full Metal Jacket to Avatar. My new test for whether or not in-flight video is good or bad is does it start prior to take off and last past landing. The good ones (of which Air NZ is now counted) can be turned on as soon as you sit down before take off and last until they switch off the fasten safety belts sign after landing. Only concern is whether not the long haul Air NZ entertainment selection is the same as short haul. If so then the number of films to watch will run out quickly – especially if headed to the US. The TV selection was not as good as CX, VS or SQ but there was more that enough to keep kids engaged. I liked the interface – very iPod like – but some of the older passengers next to me struggled to navigate around. Nobody watches the in-flight safety video any more. Airlines know this and have been trying to find way s to make them ore interesting. Air New Zealand have produced the best safety video I have ever seen. The staff are naked – covered only with body paint. It is a “cheeky” yet entirely safe for work video. First time in years I have sat and watched the video. First time ever the safety video has made me smile. Youtube link to it here and embedded version below.